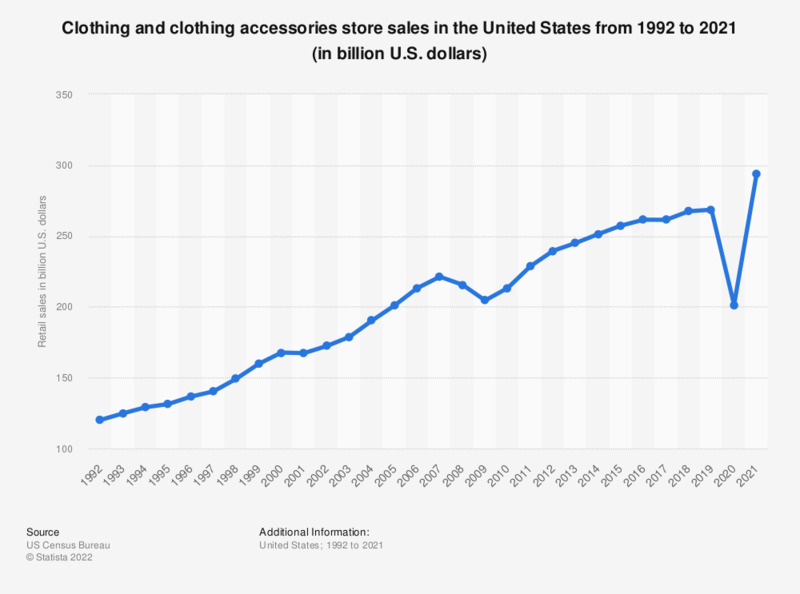 This timeline shows clothing and clothing accessories store sales in the United States from 1992 to 2017. In 2017, U.S. clothing and clothing accessories store sales amounted to about 258.74 billion U.S. dollars. According to the NAICS definition, companies operating in this sector are retailing clothing and clothing accessories from fixed point-of-sale locations. In 2012, the global apparel market was valued at 1.7 trillion U.S. dollars and was estimated to employ approximately 75 million people, making it one of the largest industries in the world. The womenswear sector accounts for 50 percent of the global demand, while the remaining market is divided between smaller sectors, such as menswear, accessories or children’s garments. Some of the largest apparel markets by country are the United States, Brazil, China, Italy and Japan. According to projections, the United States' apparel market is expected to grow from 225 billion U.S. dollars in 2012 to 385 billion U.S. dollars in 2025. Although an increasing amount of clothes are bought online, the main retail channels for U.S. American apparel companies remain mass merchants and chain clothing stores. From the total of over 187 billion U.S. dollars in clothing store sales in 2015, womenswear accounts for over 41 billion U.S. dollars, while menswear for 8.8 billion. As of 2016, the leading apparel retailer in the United States is TJX, a Massachusetts-based apparel and home goods department store chain selling off-price goods, such as manufacturer irregulars, canceled orders, goods returned by other retailers and end-of-season closeout merchandise. TJX reported retail sales of about 20.95 billion U.S. dollars and it was followed by Kohl's and Ross Stores, with apparel sales worth 18.75 billion and 12.86 billion U.S. dollars respectively. According to the U.S. Census Bureau, December is the most popular month for buying clothes in the United States. During the holiday season in 2016, clothing stores reported sales of 15.69 million U.S. dollars. Apparel Market in the U.S.
Statistics on "Apparel market in the U.S."
Apparel and footwear resale market in the U.S.